Global Footprint Network - A site with many resources on human environmental impact. In the navigation bar on the left, select "Personal Footprint" to access an interactive calculator to assess your own environmental impact. 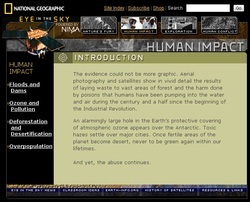 Eye in the Sky - Human Impact: National Geographic site exploring various types of human impacts on the environment. Hank Green - 5 Impacts on the Environment: Crash Course - Hank Green and John Green (a very well-known Young Adult author) have created a "Crash Course" video series on YouTube. A lot of English and history teachers at the high school use them - they're pop culture synopses of issues - it might be useful as a starting point/overview. EPA Site – Current State of the Ozone Layer - This sites contains information and links about the ozone layer, ozone depletion and environmental statements on the Ozone.